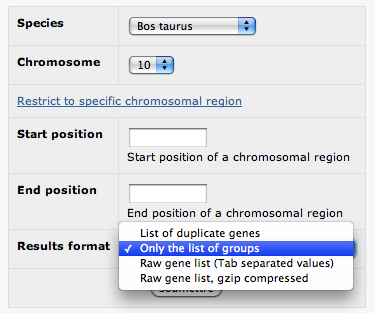 Only the list of groups: returns a table with only the group IDs and their chromosomal locations. In both cases, you can always download the RAW results (TSV, compressed or not) using the 'Raw version' link at the top of the page. 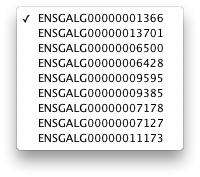 The raw version will automatically include the chosen cross-references in exported data. 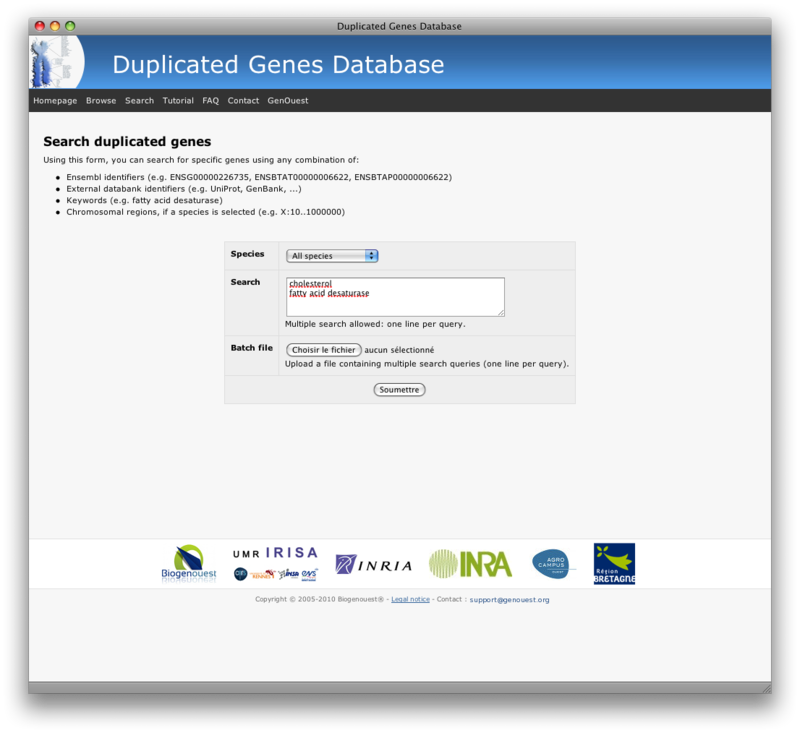 You can search for duplicated genes using either database identifiers (Ensembl, Uniprot, GenBank, ...), chromosomal regions (e.g. 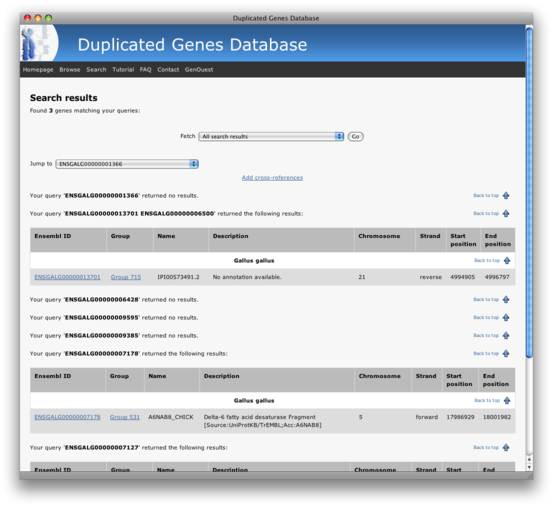 X:10..10000 to search within region 10 to 10000 in chromosome X), or keywords. 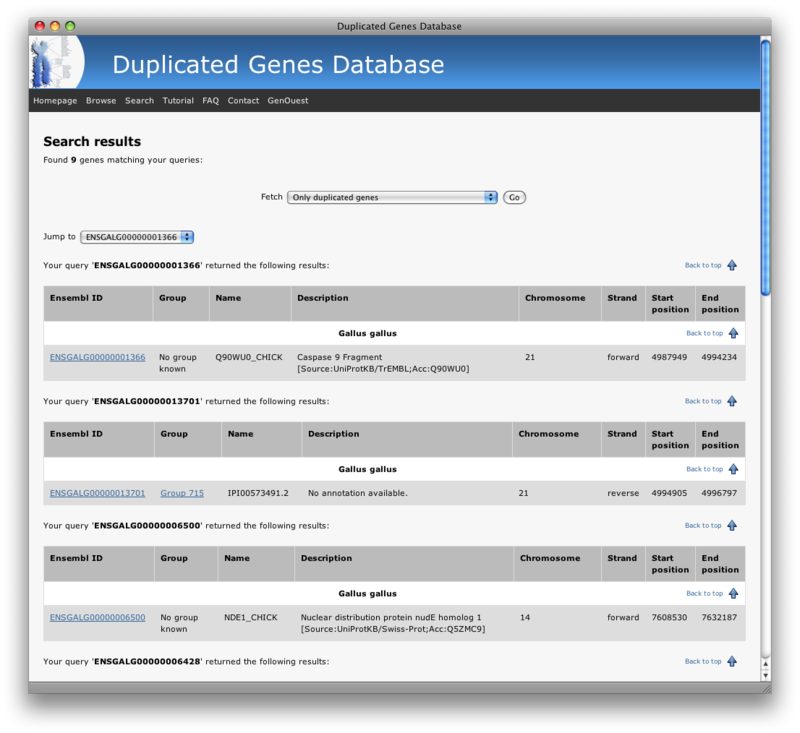 You can copy/paste/type several IDs or keywords in the input box (one query per line). But, you can also upload a text file with the IDs or keywords (one query per line). 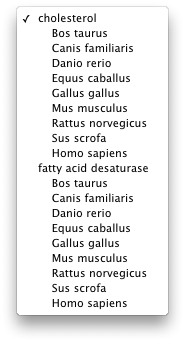 You can also select the species in which the queries will be carried out. Please note that it is also possible to perform a wide-species search (note: when using IDs, you don’t need to specify the species as many of them (like Ensembl ID) are species-specific). 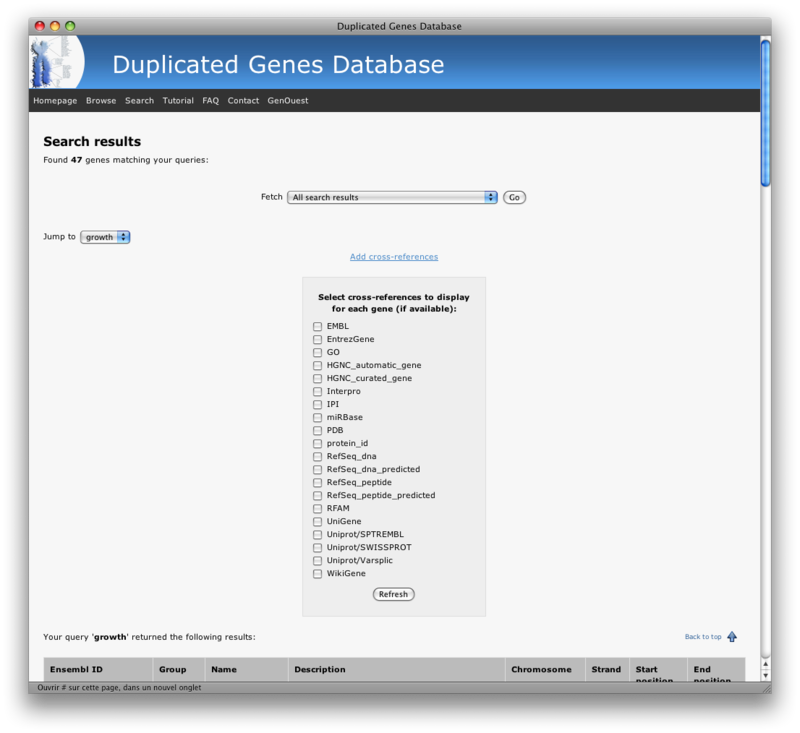 Similar to the search with ID, you can also search for duplicated genes using keywords (one or several terms, either by typing them in the input box or by uploading a text file to the server). DGD is available as a webservice using the standard SOAP protocol. The WSDL file is available at this address. A minimalistic web interface is available to test the service invocation. 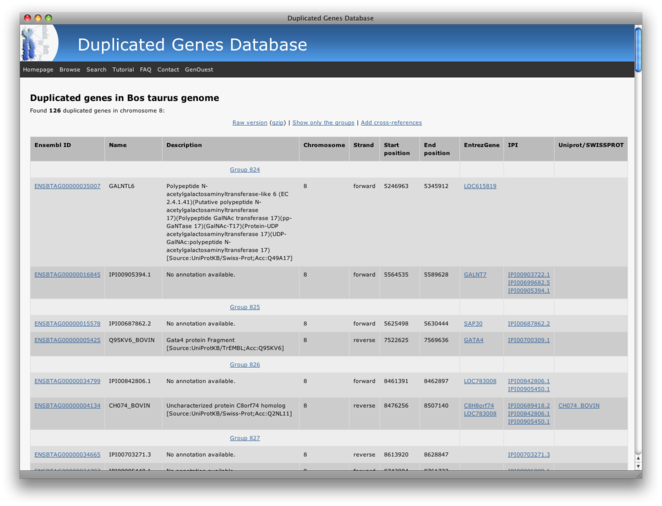 This webservice can only carry out the Ensembl gene IDs as input data and cannot allow retrieving directly xrefs in output file. 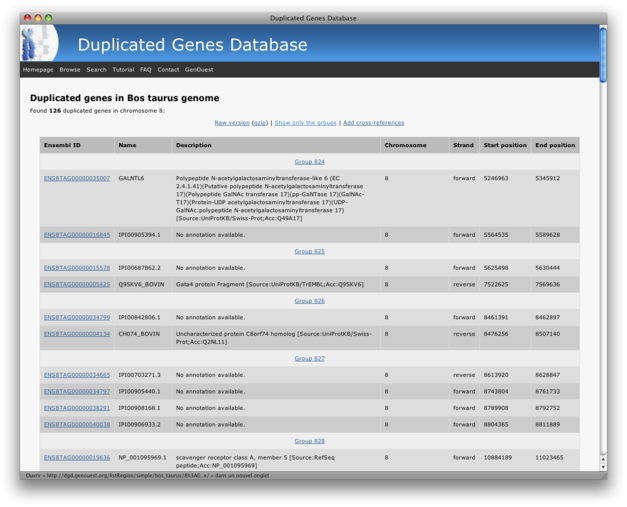 However, these features are available using another complementary webservice dedicated to cross-references: Xref (web interface). The Xref service allows you to retrieve the list of available cross-references sources for a given species. You can also retrieve a list of cross-references corresponding to the Ensembl gene IDs, or to search for Ensembl genes using different cross-references (IPI or GenBank identifiers for example). GenOuest platform is providing several other webservices, which are available here. 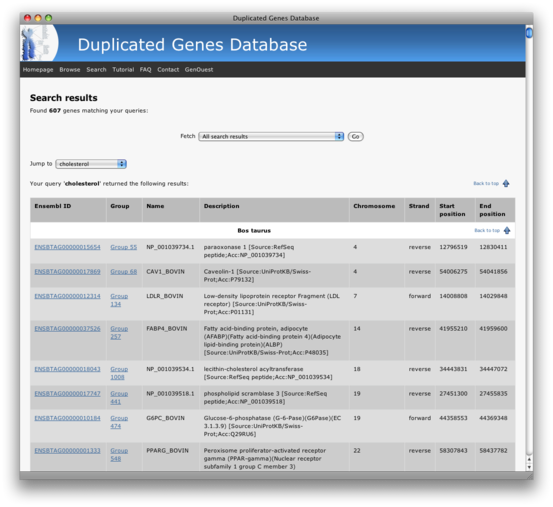 Another source of usefull webservices is BioCatalogue. Using the webservices, you can execute DGD requests directly from your java code. WSDL2Java is the perfect tool to achieve that. 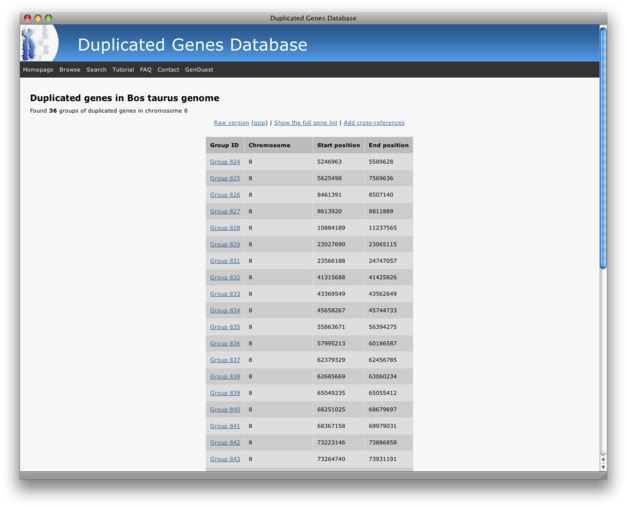 First download Axis2 from the project website. Uncompress the archive somewhere on your hard disk drive and define AXIS2_HOME environment variable (as the method depends on your OS platform, see the Axis2 documentation for more details). This command will generate some java classes that will be needed to invoke the webservice in your program. Once finished, you are ready to use this new library in your java code. Here is a simple example of an application that performs a DGD request. 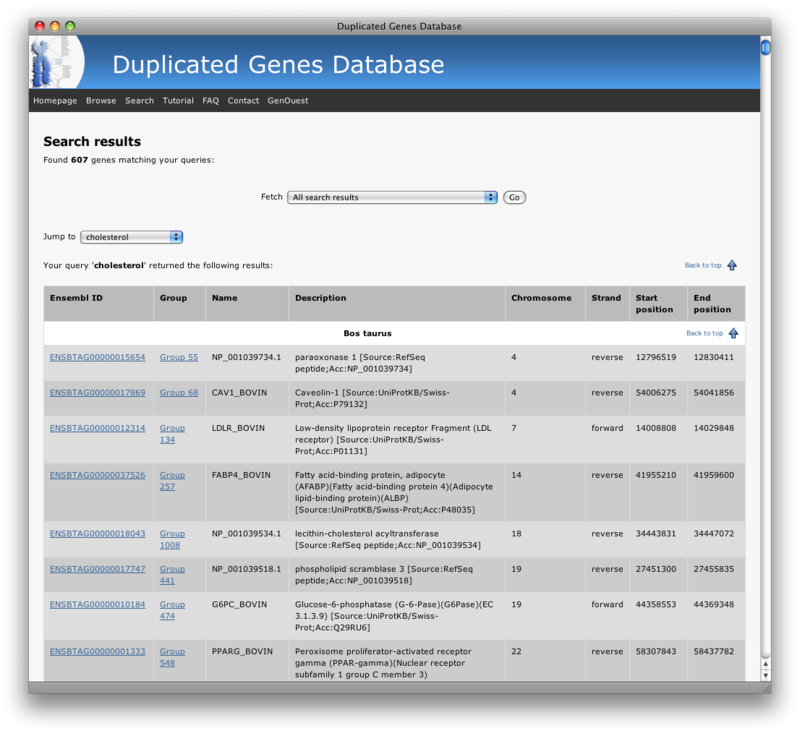 Do not forget to add your new jar file and axis2 libraries in your classpath. In this example, we use the operation 'launchJob' to request the duplicated genes on the chromosome 1 of the Bos taurus species. Another operation ('getOuputs') is available to retrieve the results. Please note that you can use similar java code to perform requests upon the Xref database. 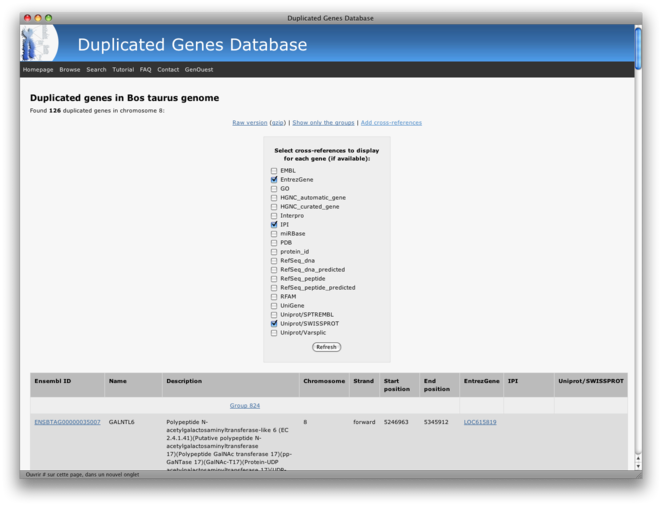 Taverna is a software that permits the creation of complex workflows using multiple web-services. An example of workflow for DGD would be to use the Xref webservice to search for all the genes matching with the 'FADS' search term and then to use the DGD webservice to extract the duplicated genes from those genes. Then, it may be interesting to retrieve the GO terms of each duplicated gene. 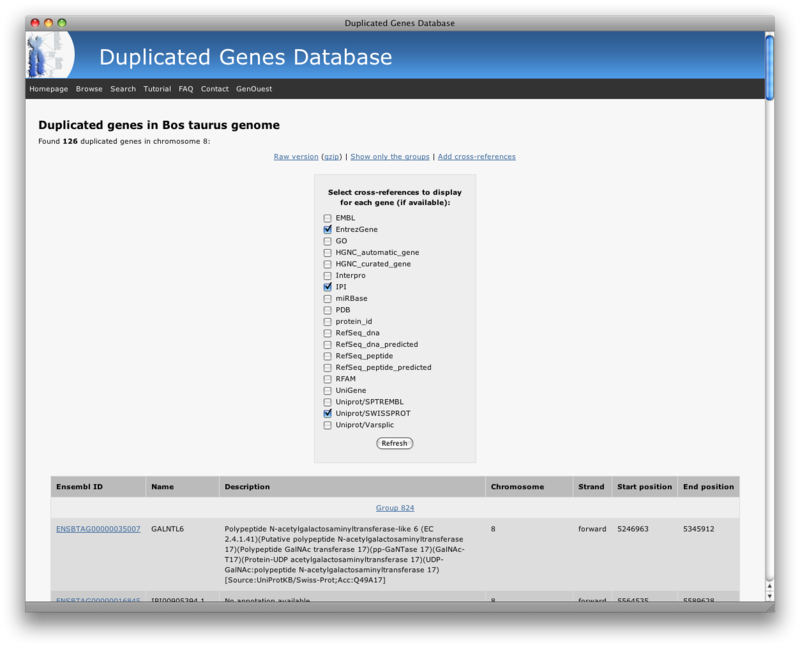 A ready to use workflow has been designed to perform this scenario and is available on myExperiment. You'll find many other workflow examples on myExperiment for other purposes (blast, clustalw, and many other tools).